Dr. Alice Villalobos is 2005-06 President of the American Association of Human Animal Bond Veterinarians (AAHABV). She is a well known pioneer in the field of cancer care for companion animals and a founding member of the Veterinary Cancer Society. A 1972 graduate of UC Davis, she completed Dr. Gordon Theilen’s first mock residency program in oncology and has served the profession by consulting, writing and lecturing in the rapidly growing field of veterinary oncology and end of life care . She was awarded the UC Davis Alumni Achievement Award in 1994, and the Leo Bustad Companion Animal Veterinarian of the Year Award in 1999. She is Editor-in-Chief of the AAHABV Newsletter, Secretary of the Animal Health Foundation of the SCVMA and Founder of the Peter Zippi Memorial Fund for Animals, with over 10,000 rescued and placed pets. Dr. Villalobos is serving as President of the Society for Veterinary Medical Ethics (SVME) for 2010-2011. She will raise discussions about the ethical obligation that veterinarians have to communicate compassionately yet frankly with clients regarding options for pets with cancer and other terminal diseases. She believes that attending doctors are obligated to offer palliative and end of life Pawspice care options for terminal pets in addition to the standard options offered for either top cabin treatment, no treatment or euthanasia. She believes that pet owners have the right to be informed that palliative or Pawspice care is a viable option over no treatment or euthanasia especially when the family cannot afford the cost of top cabin treatments for their pet. Veterinarians, veterinary nurses, staff and professionals from allied fields who care for animals and their families and concerned pet owners who would like to provide their input are invited to join the SVME at www.svme.org. Jamie started her career in veterinary medicine as a technician in 2003. She joined Pawspice and Animal Oncology clinics soon after. 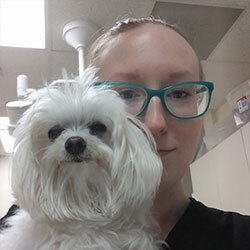 Continuing her education in the classroom, she completed an RVT program and became a licensed Veterinary Technician after passing her RVT boards. Jamie's vast professional experiences over her veterinary career have included managing, supervising and training technical staff and assistants in several large specialty hospitals in the South Bay area. As our Head Oncology Nurse, Jamie's technical skills are of the expert level. Paired with her knowledge base and extensive experience she provides each and every one of our patient's with exceptional care.